Tuesday evening business meeting and program. 5:30 pm – 8:00pm. Program: The Fantastic Challenges of Librarianship: Finding & Keeping that Job. This SIS meeting will be a workshop that will focus on resume writing, the interview process, and professional networking. Featuring panelists Tracy Elliott (State College of Florida), Renelda Sells (John F. Germany public library), and Bill Harris (Tampa-Hillsborough public library), we’ll discuss the current methods anyone in the information management field can use to get ahead and stay gainfully employed. Sandwiches from Alessi Catering, $10.00 per person. Various meat & vegetarian sandwiches (Italian, Veggie, Cuban, turkey, grilled chicken), a side, and a drink included. The food is optional. If you RSVP and order a meal, please consider it an obligation to pay even if you cannot make the meeting, since SIS must turn in the headcount for the meals in advance. An optional tour of the library will be provided at 5:30 pm, before the meeting. 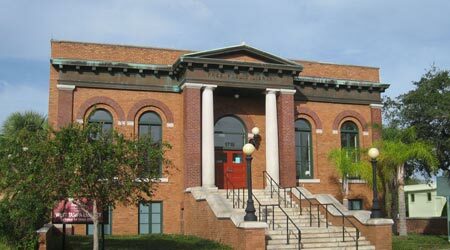 As one of only ten public libraries in Florida funded by philanthropist Andrew Carnegie, the Carnegie Library on Howard Avenue was constructed in 1913 in Neo-Classical Revival architectural style. Please RSVP on-line and indicate if you will be ordering a meal by Sunday, September 29th, 2013. For questions regarding the program or to delete your RSVP, contact Mēgan Oliver at ms.meganoliver@gmail.com.